The sugar vs. sweetener debate continues. In a previous taste test, we tested out two artificial sweeteners – Splenda (sucralose) and Equal (aspartame) to see how they performed against sugar. We did the ultimate test which was to test these ingredients out on sugar cookies which I have to admit, was quite unforgiving. The biggest difference we noticed was in the texture of the cookies. So for my next experiment, I decided to bake something where texture was not such a critical component. I decided to bake blueberry muffins (I also chose this because it just happens to be the recipe that’s on the back of the Splenda box.) Let’s see how sweetener compares to sugar with this recipe. Is it possible to bake with sweetener and get an acceptable product that’s just as good (or possibly even better) than sugar? Since I’m using the recipe that’s on the back of the Splenda box, I’m expecting a pretty decent result from the Splenda batch. I’m curious to see if these muffins will turn out as good as the batch made with sugar. I’ve heard that sweeteners aren’t as good as absorbing water and they don’t have the browning properties that sugar has so it will be interesting to see what they look like when they’re done. 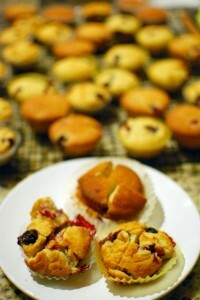 Please try each type of muffin and comment on the taste, texture and appearance. Which one do you think is made with Splenda, Equal and sugar? Well, this was very interesting! The two batches that were made with sweetener look practically identical after being baked. The ones made with sugar looked completely different and browned a lot more. This is consistent with the expectations associated with the browning properties of sugar. Another thing we noticed was the muffins made with Equal were a lot more bland and not as sweet as the muffins made with Splenda. This is also consistent with the results from the previous taste test where Splenda retained it’s sweetness properties when baked. I also found it interesting that the muffins made with Splenda tasted just as sweet as the muffins made with sugar (this wasn’t the case when we made sugar cookies). I think this partly has to do with the fact that the recipe calls for honey – which would help out with the sweetness. It’s interesting to see that Splenda came out to be nearly as favoured as sugar and in many ways, performed better from a texture and appearance standpoint. However, this is probably due to the fact that we used the recipe that was on the back of the box which are usually classic and overall favourite recipes. It will be interesting to see the results of an upcoming experiment which will involve me using a recipe that calls for sugar originally (and not Splenda). This taste test also provides further confirmation that you can bake with Splenda but not Equal. C – smooth texture and darker. not burnt but a bit of that flavour. not as sweet as the others and more cakelike. favourite as interesting flavour. A- This is probably the one I liked the best in taste. In my opinion, it was the sweetest and most moist. I feel like maybe this one was made with sugar but I can't really tell. B- I thought this one was the most appealing in looks. It was golden brown. It was less sweet than the other two muffins. For some reason I think this may be sugar because I have heard that often times sweeteners are sweeter than sugar but I don't know if this changes once something is cooked/baked. C- I feel as though this one was most likely made with a sweetener but I don't know the difference between Splenda and Equal. I say this because the taste was a little sweet but there was a certain tangy taste from the blueberries but it was different than in the two other muffins. It was the darkest in colour and in some bites I felt like I could taste sugar/sweetener crystals. I felt that all three had similar textures and honestly do not know which one was made of what. Then again, I also failed at the Pepsi/Coke challenge so maybe I need to work on developing this palate. Thanks so much for the wonderful baking Lisa and Liz! YUM!!! They were amazing! Thanks ladies! A and B look similar but A is slightly sweeter than B. C looks amazing with its golden color and it is the sweetest! I'm attracted to that one! Are the cheeses part of the taste test too? Lisa, I don't know, I don't know. A – appearance – uneven colour and surface. Texture – heavier/compact compared to 3. OK crumb. Flavour too sweet –Aspartame ??. B – appearance – pale, rough surface. Texture compact and heavier than 3 – dry crumb. Sugar?? I'm very on sure – Sugar should not produce such a dry crumb but since you are using a splenda recipe it probably explains the poor performance. C – appearance – dark – smooth surface. Texture the lightest – rose more than the others. Tender crumb but too sweet for me –Splenda?? b: fairly dry and crumbly. Didn't notice an aftertaste. c: moist. my guess is sugar. The appearance of a & b was nicer than c.
So they do all taste quite different and have differing textures. A and B are similar in texture but A is noticeably sweeter. B doesn't taste sweet at all. C is the least palatable of the three and has a very moist texture, but not in the most pleasing way. I would say that I like A the best,and normally I would assume that it's sugar. However, because this came from the Splenda box, and recipes on the back of a box, are usually "star" recipes, I'm going to say A is splenda. B: Looked similar to A in appearance but not as sweet. Bland. C: Texture was much softer, lighter and cake like. Tasted more like a cupcake than a muffin. Good flavour but not a fan on the cake-like texture.